Enjoy breathtaking visuals, rich sound, and easy operation from one interface. Today’s home media setups have features such as state-of-the-art HD and 4K panels, powerful distributed audio/video, video walls, mounted televisions, and more. Imagine being able to stream music, movies or your favorite TV shows from anywhere in the house, whenever you want. In addition, we can set up your smart home media system to be controlled straight from your smartphone or tablet! 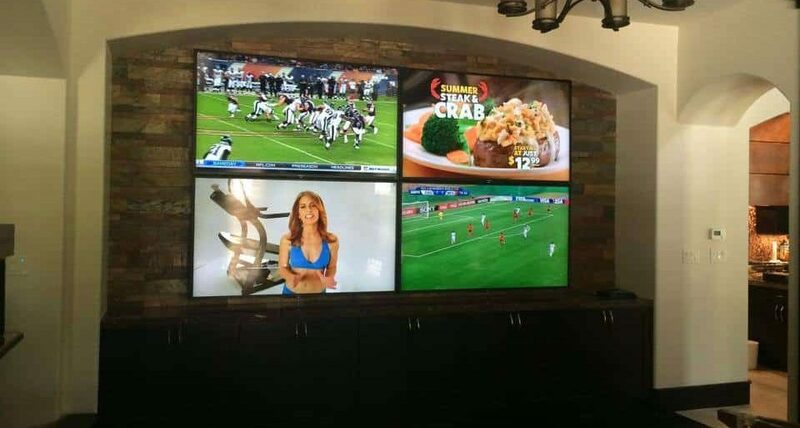 Would you prefer mounted TVs throughout your house or a big multi-panel video wall? Or how about a full home theater with comfortable seats, a crystal clear projector, and a big screen? We can also do all the above. iEvolve Technology offers powerful home visual solutions that allow for a comfortable, immersive home viewing experience. Plus, we can set up a single source to distribute video throughout the house. You won’t be missing a thing! Did you know we offer audio distribution systems? We can strategically install speakers throughout the house with a design to blend-in perfectly into its location. Enjoy your favorite music from anywhere in the house at the touch of a button on your smartphone or tablet device. Wired and wireless solutions are also available, depending on the home as well as your personal preferences. Control your climate, regulate your energy usage, lighting, and more at the touch of a button, the sound of your voice, or at specific times of the day. Smart home automation allows you to have even more control of your home. We can also set up and connect all of your Alexa®-enabled devices so you can control these devices with the sound of your voice. In addition, our home automation solutions can integrate with your home security system for an additional layer of protection. iEvolve Technology home theater solutions bring the rich sound and visual experience of a movie theater straight into your room of choice. Specially-designed acoustics system isolates your home theater room from outside noise, allowing for maximum enjoyment of your favorite movies. We install the perfect projector and screen combination for the highest quality viewing. Available comfortable theater seating allows for an even more pleasing experience. Most importantly, you will have total control of everything—even the lighting! iEvolve Technology ensures that your home will be connected with the installation of WiFi access points throughout the house. Plus, we can also install a hardwire network for even better performance. We want you to have a consistent, strong connection for all of your devices no matter where you are in the house! Enjoy your home in ways you never thought possible. We have installed incredible audio/video technologies into numerous exclusive homes and businesses in the Greater Houston area. Our team has the expertise to design and execute the finest audio/video solutions available. iEvolve Technology only uses the best technology and equipment available in the industry today. We do not believe in cutting corners and firmly stand behind our work. Our sales process is low-pressure and fully transparent. We don’t believe in selling you anything that would not be of value to you and your home. Most importantly, we believe in providing the exclusive, premium service you deserve. We serve the entire Greater Houston area, from Katy and Cypress to Pearland and League City.